VirtuRAD is a finalist of the Google.org Impact Challenge, a widely noticed competition for new technology in non-profit projects. You can foster the progress of VirtuRAD by voting for us and sharing this information: https://impactchallenge.withgoogle.com/deutschland2018/charities/virturad. Thank you for your support! 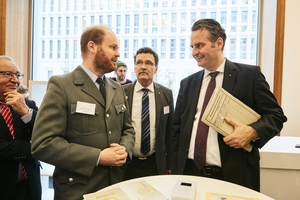 VirtuRAD has received 2017's Helfende Hand (Helping Hand) from Federal Minister of the Interior, Thomas de Maizière. The project could qualify for the special award for the best technical advancement in the Innovative Concepts category. The reward of 5000 euros enables us to offer VirtuRAD for manufacturing costs or less. Also other ideas regarding the training of first responders to radiation accidents can be realized with the money. The excellently organized event and its imaginative performances permitted various occurrences for networking with the staff of the other organizations and the decision-makers in the ministry and the federal office. Watch the video presentation of VirtuRAD at the Helfende Hand on ABC-Zug München-Land's YouTube channel. The first training in a radiological scenario was successfully held at the ABC-Zug München-Land, the CBRN response unit in the District of Munich. A lorry with trailer, which carried scrap metal, caused an increased reading when going through a mobile portal monitor. 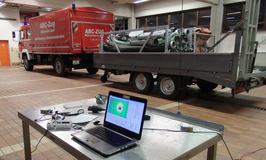 The expert staff of the ABC-Zug were assigned to assess the situation, to spot the radiation source and to estimate its strength. The backgorund of this situation is the threat by smuggling radioactive substances for their malevolent use.The scrap metal, within which the simulated radiation source was placed, caused the doserate to vary strongly at different positions around the trailer. Only advanced methods for determining the position of radiation sources allowed the staff to spot the source in the end.